Thank you! I'll reach out to you shortly with more information on this listing. Magical Oceanfront Estate. 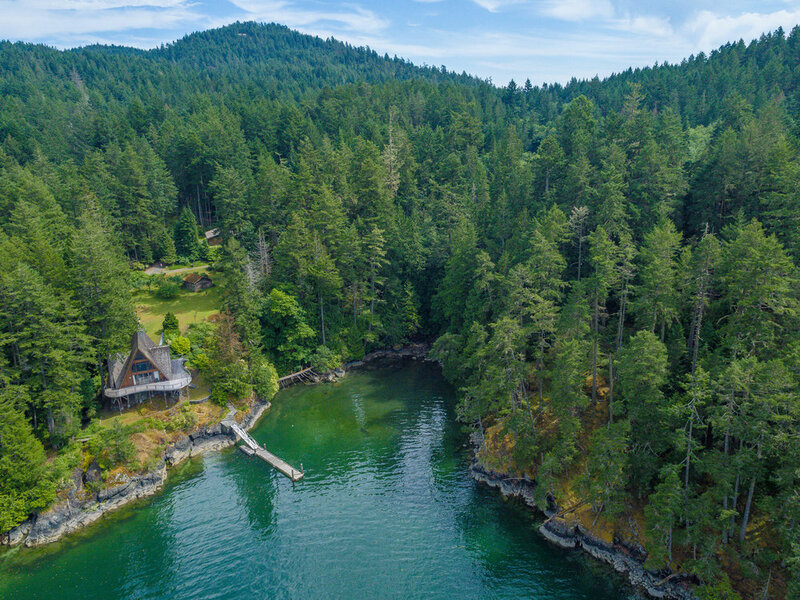 This vast property has 150 acres with almost 2000' of ocean frontage on the sheltered shores of Sooke Basin where the dock offers year-round moorage for both seaplane & boat. "Waterfall Cove" offers 150 sub-dividable pristine and private acres near the famed "Grouse Nest" resort. Intersected by Gillespie & Mt. Matheson Rds, the property is mostly natural state with 5 species of valuable timber. The custom built double A-frame home was designed, built and crafted in 1969 by a renowned architect and his European artisans to showcase the passage of light from morning to dusk and feels like you are Captain of your ship. The expansive 1,360 sq. ft wrap-around deck overlooks the ocean. Additional outbuildings include a caretakers cottage and original log home. Fresh air and cascading waterfalls beckon at your door. Kayaking, sailing, fishing, crabbing and clam digging are fun pastimes and the famed Galloping Goose Cycling Trail and East Sooke Park are popular nearby attractions. 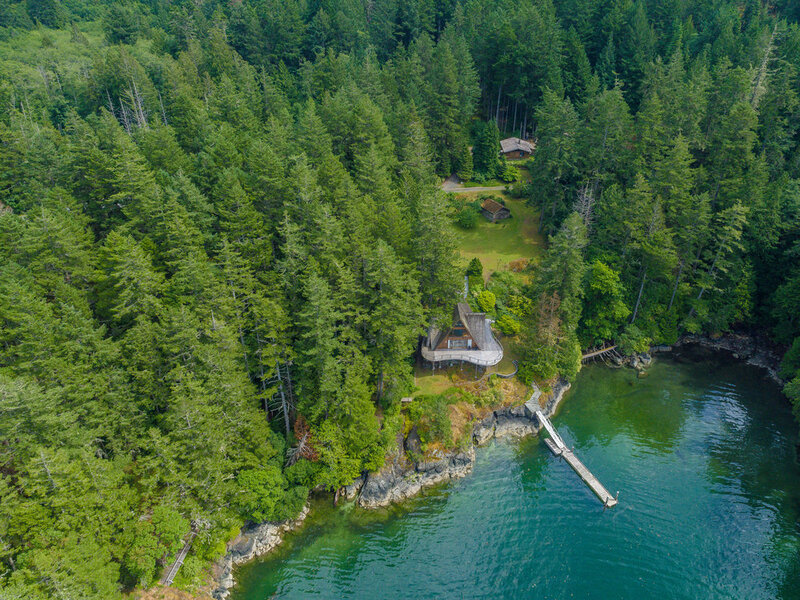 Just 40 minutes from Victoria this East Sooke location offers a year-round retreat. Just breathe the air! East Sooke is an unincorporated community situated south and east of Sooke, British Columbia, Canada. It consists of over 500 houses (and one volunteer fire department) on the south side of the Sooke Basin. East Sooke borders on East Sooke Regional Park, an area of 14.3394 square kilometres (3,543.3 acres), with views south to Olympic National Park in the United States. East Sooke does not have a town council. Instead it is governed by a Regional Director who is also responsible for other unincorporated areas in the Capital Regional District (the regional district Victoria, British Columbia). East Sooke's general character is rural, although it is a bedroom community of Victoria, British Columbia. Its close proximity to Victoria, its character as a bedroom community, and its large tracts of undeveloped land have made it an attractive location for recreation and retirement developments. Political scuffles over the development of the community have led to two large sections of East Sooke splitting off and joining Sooke. Those in Sooke generally consider this to be a positive acquisition, whereas those in East Sooke consider it a non-hostile occupation. Due to these recent incursions into East Sooke territory, the expectation is that East Sooke will ultimately be swallowed by a neighboring community, be it Sooke or Metchosin, British Columbia. The population of East Sooke is roughly 1,500 (2001 census: 1,434) . There is no town core, but there is a single convenience store. Typical of the rural nature of the community, not only can one purchase a litre of milk, or a loaf of bread, but one can buy animal feed, or a truck load of gravel from that store. East Sooke is a mix of small residential subdivisions, small hobby farms, and wilderness. There are currently no schools in East Sooke although there have been plans for an elementary school for a number of years. Some children are bussed to Sooke schools. This community is part of School District 62 Sooke. Many families in East Sooke homeschool their kids negating the need to travel to Sooke for school. This area has a vibrant homeschooling community and there are multiple programs available for families who choose to teach at home.